Vice President Mike Pence, right, listens to Manuel Padilla, U.S. Border Patrol Rio Grande Valley Sector Chief, center, while touring the border wall with Senator Ted Cruz and wife Karen Pence Friday, February 16, 2018, in Hidalgo. HIDALGO — After touring the international bridge, racing down the Rio Grande lined with Mexican military and sitting down for an interview with one of his boss’s favorite television shows, Vice President Mike Pence got the photo opportunity that so many officials over the last nine years visit the Rio Grande Valley for. 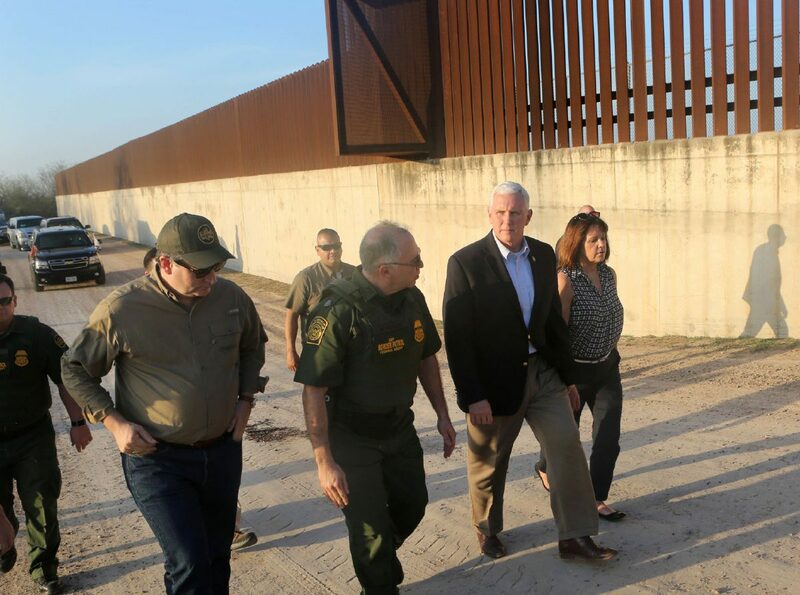 Flanked by his wife, Karen Pence, the vice president walked alongside the levee wall in Hidalgo, with the bollards towering in the background as television cameras and photographers documented his tour. Joining Pence were Homeland Security Secretary Kirstjen Nielsen, acting Customs and Border Protection Commissioner Kevin McAleenan and Texas Republican Sen. Ted Cruz. Nielsen knows the photo op well. She positioned herself perfectly for it in December, a week into taking office. She toured the area before hosting a press conference about 100 yards away from Pence’s Friday levee wall stroll. She stood in the shadow of the bollards on Dec. 14, 2017, though on the other side, and talked about the need to carry out President Donald Trump’s polarizing promise to build a border wall across the U.S.-Mexico border. On Friday, Pence tried to get a glimpse of the region, spending nearly four hours touring an 8-mile area. The last of such visits from Washington was in 2006 when President George W. Bush held a news conference at Anzalduas Park with a clear view of the Rio Grande, and Mexico, as a backdrop. That same year, Bush signed the Secure Fence Act, which mandated the construction of 670 miles of fence along the border. In Hidalgo County, the drainage district built 20.26 miles of fence combined with a concrete levee barrier, paid for by the county and U.S. Homeland Security. Under the levee-fence plan, the county paid $44 million, or about 24 percent of the $114 million project. The steel and concrete fence was completed in January 2009 despite opposition from Hidalgo County officials citing social and economic issues, according to a December 2008 Monitor report. Pence attended a roughly 30-minute briefing inside the port that featured his wall walking partners, as well as Border Patrol RGV Sector Chief Manuel Padilla, CBP Director of Field Operations in Laredo David Higgerson, U.S. Attorney for the Southern District of Texas Ryan K. Patrick, Hidalgo County Sheriff Eddie Guerra and various other federal law enforcement. “Customs and Border Protection actually apprehends 1,100 people crossing the border illegally every day, and we just heard that last year at this border crossing you processed some 7 million people coming into the country legally,” Pence said. “Homeland Security, I am told, refuses entry to seven known or suspected individuals who may have terrorist intent in this country every day, or roughly 2,500 a year. It underscores the importance of the work. Padilla explained that 45 percent of all human and 30 percent of all narcotics apprehensions on the U.S.-Mexico border last year occurred in the Valley. “ About $78 million this year will go to the cartels based on human smuggling taking place in this sector,” Padilla added, as Pence took notes on a legal pad. Whether Padilla told Pence in private that the area, not the border, is safe, is unclear. McAllen Mayor Jim Darling, who greeted Pence as he arrived on Air Force Two, did, he said. “ Safe and sound” was the theme of Darling’s State of the City address earlier this month. After the river tour, Cruz couldn’t tell how much the tour of the area resonated with Pence. Pence then sat down for an interview with “Fox & Friends” outside the Hidalgo County Water District 3 Pump House, where his boat tour launched from and the levee wall seals off. Afterward, he was driven in a half-circle before exiting his vehicle for his walk, and the photo op. Pence and his wife met up with Nielsen, McAleenan and Cruz. The group strolled as cameras captured the scene with the bollards as a backdrop. At the end of the roughly 100-foot walk, not too far away from where Nielsen had her December news conference, a crowd of Border Patrol agents waited. Some cameras were whisked away, while others were allowed to stay. Pence posed for photos with the bollards in the background. And with that, Pence’s tour, and potential preamble to another border barrier, was complete.